One of the best things about Z for Zachariah, the new drama starring Margot Robbie, Chiwetel Ejiofor, and Chris Pine, is that even after seeing the movie twice, I still have no idea how I feel about any of its three protagonists. That’s by design. Based on Robert C. O’Brien’s 1974 sci-fi novel, the movie plays like a Rorschach test: Your reaction says more about you than it does about anyone in it. That it takes place after the world has basically ended is, weirdly, almost beside the point. This is the third offering from director Craig Zobel, whose previous films, Great World of Sound and Compliance, were both populated strictly by either victims or victimizers, in environments lacking much hope or warmth. Zobel has hardly gotten soft and cuddly with Zachariah, which argues that even though human beings can do amazing things, we will always, always ruin everything with our inherent distrust and self-interest. Even if we’re living in a post-apocalypse—even if there’s only three people around—we’ll find a way to screw it up just by being ourselves. Maybe don’t let this guy give your wedding toast. As the movie opens, Ann Burden (Robbie) is living in the American South somewhere, holed up in her family home in the wake of an unspecified nuclear disaster that occurred about a year ago. (Zobel gives us very little information about anything or anyone, leaving us to make our own assumptions.) Figuring she’s all alone in these lush, empty woods, she’s startled to encounter John Loomis (Ejiofor), a scientist who also hasn’t seen anyone else for a very long time. They become friends, and a cautious attraction develops between them, even though she’s a God-fearing woman—her father was a preacher—and he’s a fatalistic atheist. And that’s when the third wheel arrives in the form of Caleb (Pine), a gregarious good ol’ boy. Full of so much Southern charm you don’t quite trust it, he tells them he’s just passing through, but Ann insists that he stay with them, immediately causing friction between the two men. 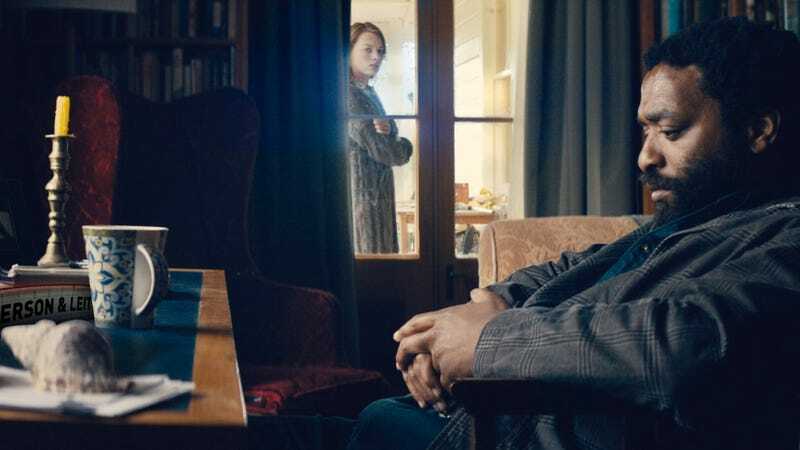 Because there are no flashbacks, Zachariah operates in its own little biosphere, forcing us to decide if believe what these characters are telling each other. There are reasons to be skeptical. John has a picture of a woman, but when Ann asks if that was his wife, he says no and clams up. Caleb tells the others that he was working in a mine when the nuclear blast happened and barely escaped, but he’s vague and withholding, too. Even Ann’s insistence to John that she’s had wine before leaves you suspicious—after all, she is a goody-goody preacher’s daughter. In its quiet way, the result is incredibly tense and paranoia-inducing, the beauty and stillness of the surrounding countryside magnifying the lingering, unanswered questions we have about these three people. Zobel’s movies can feel like cinematic lab experiments in which he coldly slides his characters under a microscope to see how they’ll react. (This was especially true of 2012’s Compliance, in which fast-food workers are unknowingly terrorized by a sadistic prank caller in a parable about how power dynamics and groupthink can wreak havoc.) His view of human behavior is just as bleak here: He turns a simple love triangle into something truly insidious and troubling. Much like Neil LaBute, he takes a dim view of humanity in general and his characters in particular, so it’s no surprise when John starts worrying that not only is Caleb trying to steal Ann for herself, but he means to kill him, too. (The more that Caleb flashes that handsome grin of his, the colder he gets.) And yet, the two male characters have to ignore these tensions and focus on the task at hand: generating power to the house by building a waterwheel at the top of a nearby waterfall. Zachariah lets a wry irony drive the narrative: When John, Caleb, and Ann work as a team, they’re able to build a great little community through their intelligence and ingenuity. It’s only when their emotions get in the way that civility breaks down. Soon enough, John notices that Caleb and Ann are developing a flirtatious bond, and cynically assumes that it’s just because Caleb is white. As things develop, we see more and more of the action from John’s perspective, his sense of being abandoned—of being the odd man out. But Zobel still keeps us off-balance. The film is rich with unsubstantiated insinuations, and lets our resulting anxieties linger like a dull ache. We’re sure that something bad is gonna happen, and when it finally does, it’s both grimly predictable and also a bit of a relief, even if we end up feeling worse afterward. The real world helps ratchet up this movie’s tension, too. When it premiered at Sundance in January, no one had yet seen Robbie (also great in The Wolf of Wall Street) as the duplicitous femme fatale in the Will Smith vehicle Focus. But after watching Zachariah again recently, I realize that my interpretation of Ann is even more complicated because of Robbie’s previous work: This meek, sweet, slightly naïve character must be hiding something, right? Likewise, since that initial Sundance screening, the Will Forte TV comedy Last Man on Earth has given us another take on love and human fallibility at the end of the world; especially in comparison to that uneven sitcom—I couldn’t make it though the first season—I found Zachariah truer to how I imagine such a scenario would play out. Zobel is still playing with the notion of victims and victimizers, and it’s probably worrisome that I found myself immediately identifying with the guy getting screwed. Which is why this film’s ending still bothers me so much. Even if the characters’ actions are often mysterious, Zobel is confident enough to know that we’ll find a way to identify with at least one of these people. But there are no good options here. It’s human nature to see ourselves up on the screen, but whichever character we choose this time, we’re not going to like what we see.